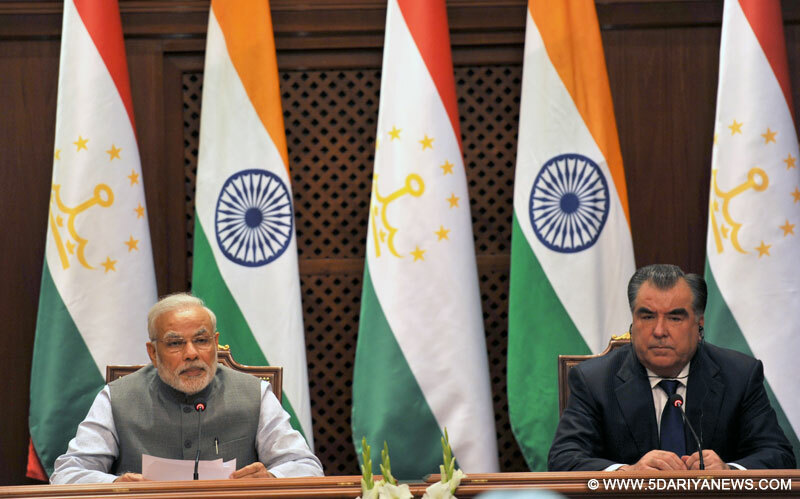 The Prime Minister, Shri Narendra Modi delivering his statement to media at the Joint Press Briefing with the President of Tajikistan, Mr. Emomali Rahmon, at Qasr-e-Millat, in Dushanbe, Tajikistan on July 13, 2015. Prime Minister Narendra Modi on Monday said combating terrorism is an important area of cooperation between India and Tajikistan which are located in the proximity of the main source of terrorism Modi, in a media statement after holding talks with Tajikistan President Emomali Rahmon, also conveyed his appreciation to Tajikistan for supporting India's candidature for a permanent seat in the UNSC. "At a time of growing threat of terrorism, we have resolved to intensify our cooperation further. Combating terrorism and extremism has always been an important and productive area of cooperation," he said. "We are located in the proximity of the main source of terrorism. Combating terrorism has always been an important area of cooperation," External affairs ministry (MEA) spokesperson Vikas Swarup tweeted Modi as saying. "I conveyed appreciation for Tajikistan's continued support for India's candidature for permanent membership of UNSC," he quoted Modi as saying.Both sides also agreed to boost their defence cooperation. "We agreed to further strengthen our defence cooperation. It is a strong pillar of our strategic partnership," he said. Modi also said that both sides had agreed to promote the International North-South Transport Corridor. "Other connectivity measures in region will strengthen links," the MEA tweeted Modi as saying. "Connectivity is vital for realising the full potential of trade and commerce between our countries. We discussed measures to tap the rich potential in trade and commerce and to encourage joint ventures and investments," he said, according to tweets posted by the PMO.Modi said Tajikistan "is my last stop on a visit to the five Central Asian countries. But we sometimes save the special one for last".He also extended an invitation to President Rahmon to visit Delhi. Earlier, after talks with President Rahmon, both sides inked agreements in the field of culture and human resource development.